Gulalai Ismail set up Aware Girls at the mere age of 16 when she realized that women and girls needed a platform to voice their rights. It has been 10 years since the establishment of Aware Girls, and Gulalai is continuing to expand her programs in areas such as southwestern Baluchistsan and Afghanistan, where it is still a challenge for women and girls to study and access justice. In 2013, Gulalai was awarded the 2013 Democracy Award by the National Endowment for Democracy for tireless work in reaching out to the marginalized community to combat violence and stigma. We reached out to Gulalai in observance of the International Day of the Girl Child, and she shared with us her story, her inspiration, and the rule of law challenges women and girls face in Pakistan every day. What inspired you to begin working on women and girls' rights? What challenges did you face when you were trying to set up Aware Girls? I grew up in a culture where women are respected no more than men’s property, where girls are taught to have the only dream as getting married and are brought up in a way which makes them perfect wife and daughter in law. Women are dehumanized in the name of “Honor, Respect, and Culture”. Women are subjugated to men, the relation of men-women is more like Master and Slave, so men have every right to exploit and oppress women. Being a girl, I think no one can easily accept it. Everyone want to have a life of their own but girls are not given the choices. I was fortunate to have a father who was determined for educating his daughters as well, he was a teacher and a human rights activist. My father brought us story books which were about equality, and he also brought newsletters of human rights organizations which had research about human rights situation in Pakistan. My father was human rights activist so I had also met women who were very strong, inspirational and were leading the women rights movement of Pakistan. There were few well known women in politics as well in Pakistan, they seem different from my culture but I believe it’s possible to build communities were women can take leadership roles and can make decisions of their own lives. Living a life being a girl in a culture, which discriminate girls in every aspects of their life created this urged in me to speak for equality, I started by writing poetry and drawings on the issue of discrimination with girls. My family was thrilled to see me speaking up against gender discrimination. My father mentored me and linked me to opportunities which I can use to strengthen my leadership skills and knowledge. I became part of Child Rights Advocate Forum (a group of Children who were part of a program of a local organization), which was an opportunity for me to talk to reach out to other girls. I soon realized that many girls have internalized the discriminatory norms and values and find little spaces to raise their voices. It gave me the motivation to create a platform for young women and girls from where they can raise their voices for their rights. As soon I started High School I, my sister, and few other friends decided to establish Aware Girls. How do you think the rule of law can benefit women and girls? 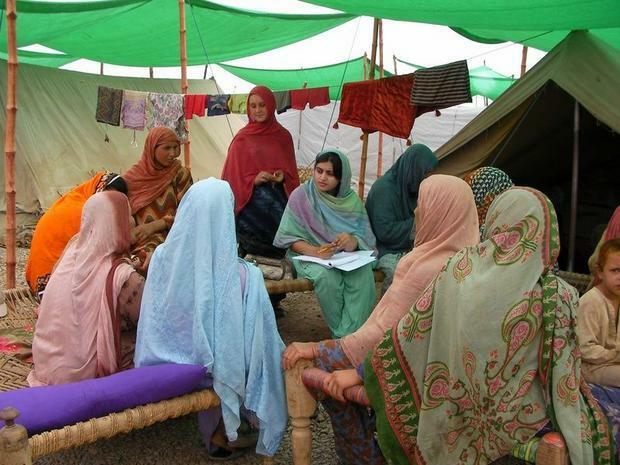 Is it easy for women and girls to access legal services in Pakistan? Women in Pakistan have been severely disadvantaged and discriminated against. They have been denied the enjoyment of a whole range of rights - economic, social, civil and political rights and often deprivation in one of these areas has entailed discrimination in another. Women who have been denied social rights including the right to education are also often denied the right to decide in matters relating to their marriage and divorce, are more easily abused in the family and community and are more likely to be deprived of the right to legal redress. Often abuses are compounded; poor girls and women are trafficked and subject to forced marriage, forced prostitution or exploitative work situations such as bonded labour. In all of these situations they are likely to be mentally, physically and sexually abused, again without having the wherewithal to obtain justice. Gender inequality is evident in all spheres in Pakistan ranging from laws to customs. Though the legislation around women rights has been increased in the past years such as legislation against sexual harassment and harmful practice against women but much is needed e.g. there is no law against domestic violence because violence against women is considered “Normal” in Pakistan even by the policy makers. Laws which protect the rights of women and then rule of law will greatly benefit women, because laws will provide a protection mechanism to women, will empower them. Unfortunately we don’t have sufficient laws which protect women. Through Aware Girls we are working on establishing citizens committess of men and women which will draft Citizens Charter of Demand for Women Rights, these Citizens committess will advocate with political parties, policy makers and parliamentarians for legislating and developing systems of protection for women. What services are least available and most needed? Every human right of women is equally important and urgent. In the cultural context of Pakistan and Khyber Pakhtunkhwa Province access to education, employment, healthcare services, and system of protection against gender base violence seems urgent and important. How do you think we can help improve girl’s access to justice? First of all, we need sufficient laws and systems which can protect women, and have to challenge the taboo and stigma related to women who access justice (legal justice). In the North West of Paksitan it is considered shameful and disrespectful if women go to courts and ask for justice. So removing the stigma related to the access of women to justice is primary along with having systems of protection and justice for women. Given the theme of this year's International Day of the Girl Child, how can education advance the rights of women and girls in Pakistan? Educated women are much likely able to exercise their human rights, they can get information about the systems of protection, can be economically empowered, can access jobs, and be part of politics. However, from our experience, the non-formal education about human rights is much more important. The school education can work for empowering women if it is unbiased, gender sensitive and raise awareness among girls about their rights.